Latest In Beauty Summer Glow Box. As soon as this beautiful Latest In Beauty box arrived this morning I was straight up taking pictures just so I could eat those two bars of chocolate, dedication to the chocolate cause right there (FYI - it was GOOD). Latest In Beauty (incase you didn't know) is a beauty box service with a difference, they don't offer subscriptions and instead off limited edition themed boxes that are packed full to the brim with beauty products and often other goodies too. They also have a "build your own" service where you can select samples (and often full sized products too) to build your own little box. 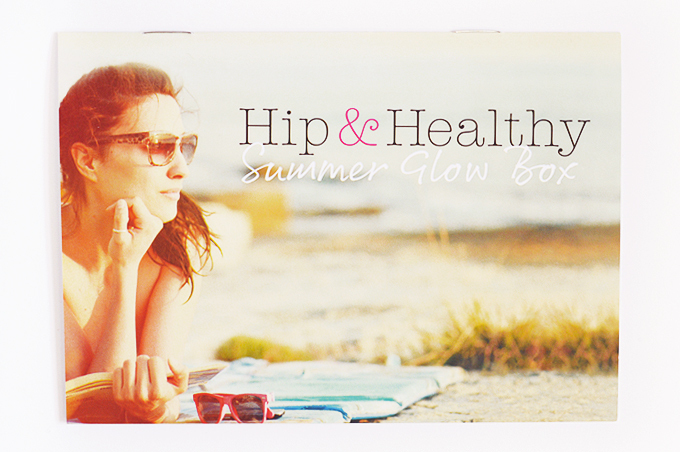 I was lucky enough to be sent their most recent themed box, a collaboration with Hip & Healthy, their Summer Glow Box*. 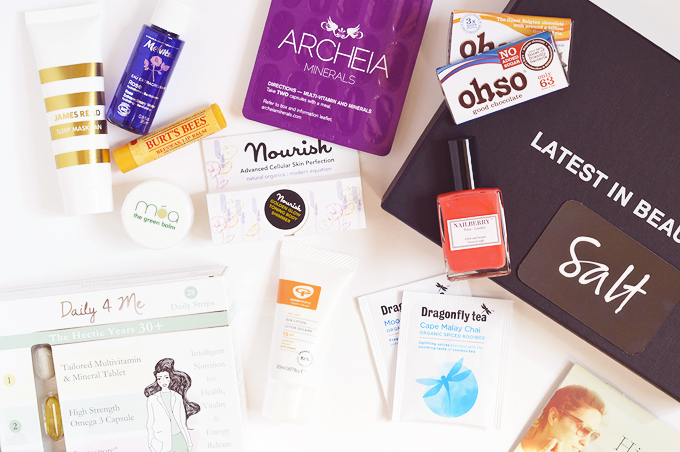 This box was right up my street as it's packed full of healthy, green beauty brands that I am oh so excited to try! As I only received my box a few hours ago I haven't had a chance to test anything yet but I am pretty excited to get stuck in. The first thing that caught my eye was the massive box of Inner Me supplements, this is a full size, 1 month supply worth £30, double the price of the box! Even though this says its for 30+ and I'm only 22 I will probably give these a go as some omega 3 & probiotics never hurt anyone! There was also another pack of capsules, this time from Archeia, a brand I've never heard of. This is a beauty supplement and it looks really interesting so I'll be sure to give them a go too! The full size box retails for a whopping £67 but I can't find out how many capsules are in a box.. I'm guessing this strip is worth between £5 & £10 perhaps.. Onto beauty and we have a few new-to-me brands such as James Read & Nourish. I've wanted to try Nourish for absolutely ages now so I'm glad to be able to try something from them! The James Read Sleep Mask Tan sounds super interesting for ghost girl over here, but I can't find the ingredients anywhere online?! annoying. I was really happy to see the Melvita Rose Extraordinary water as I love their narcissus version & a Nailberry nail colour in Groseille, which is an close dupe for my fave nail shade ever.. Mavala Waikiki Orange! Score. There is also a Moa Balm, always handy, a Burt's Bee's Lip balm and a sample sized Green People SPF 15 Sun Lotion, perfect. A couple of other extra's included (does this box ever end?!) two bars of ohso good for your chocolate, two sachets of Dragonfly Tea aaaand finally a £20 voucher to Salt Resort Wear. All in all a fantabulous box that is definitely worth £16.95 dontcha' think?! Ooo this one definitely looks worth a go! This is such good value for the money, plus its defiantly got a good variety! This looks like such a fun box, I love when there is a good mix of products - and chocolate! The nail polish shade is super stunning!